Records dating from the reign of Paul II (1464-71) relate that the picture of Our Lady, at first called "La Madonna del Paradiso" and now better known as "Madonna del Buon Consiglio", appeared at Genazzano, a town about twenty-five miles southeast of Rome, on St. Mark's Day, 25 April, 1467, in the old church of Santa Maria, which had been under the care of Augustinians since 1356. The venerated icon itself, which is drawn on a thin scale of wall-plaster little thicker than a visiting-card, was observed to hang suspended in the air without the slightest apparent support; thus early tradition, which furthermore tells how one might have passed a thread around the image without touching it. At once devotion to Our Lady inSanta Maria sprang up; pilgrim-bands began to resort thither; while miracles in ever-increasing numbers, of which a register was opened two days after the event, were wrought, as they still continue to be, at the shrine. In July following, Pope Paul deputed two bishops to investigate the alleged wonder-working image. Their report, however, is not known to be extant. The cult of Our Lady increased. In 1630 Urban VIII himself went to Genazzano on a pilgrimage, as didPius IX in 1864. On 17 November, 1682, Innocent XI had the picture crowned with gold by theVatican Basilica. In 1727 Benedict XIII granted the clergy of Genazzano an Office and Mass ofOur Lady for 25 April, anniversary of the apparition, elsewhere the feast being kept a day later so as not to conflict with that of St. Mark the Evangelist. On 2 July, 1753, Benedict XIVapproved of the Pious Union of Our Lady of Good Counsel for the faithful at large, and was himself enrolled therein as its pioneer member; Pius IX was a member, and also Leo XIII. 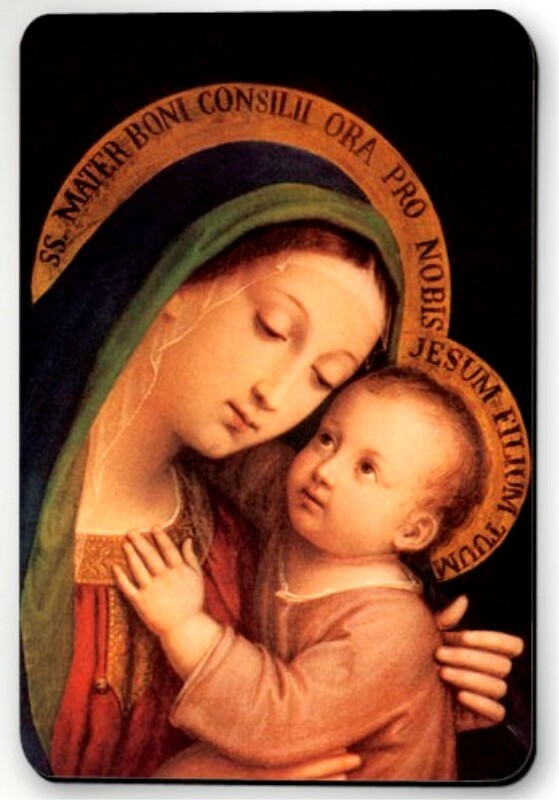 On 18 December, 1779, Pius VI, while re-approving the cult of Our Lady, granted all Augustinians anOffice with hymns, lessons, prayer and Mass proper of double-major rite; with a plenary indulgence also for the faithful, to which Pius VIII added another for visitors to the shrine. On 18 December, 1884, Leo XIII approved of a new Office and Mass of second-class rite for allAugustinians, while on 17 March, 1903, he elevated the church of Santa Maria — one of the four parish churches at Genazzano — to the rank of minor basilica; and, on 22 April following, authorized the insertion in the Litany of Loreto of the invocation "Mater Boni Consillii" to follow that of "Mater Admirabilis". The same pontiff, ten years earlier (21 December, 1893) hadsanctioned the use of the White Scapular of Our Lady of Good Counsel for the faithful. In theUnited States there are many churches and institutions in honour of Our Lady of Good Counsel.